To learn your way around IntelliJ IDEA’s keyboard shortcuts there’s nice “Key Promoter” plugin to train yourself. It prompts whenever you use the mouse when you could’ve used the keyboard instead (similar to Eclipse’s Mousefeed). You may be tempted to just go with the Eclipse keymap but it’s better to learn the IDEA way although it’s quite irritating at start. 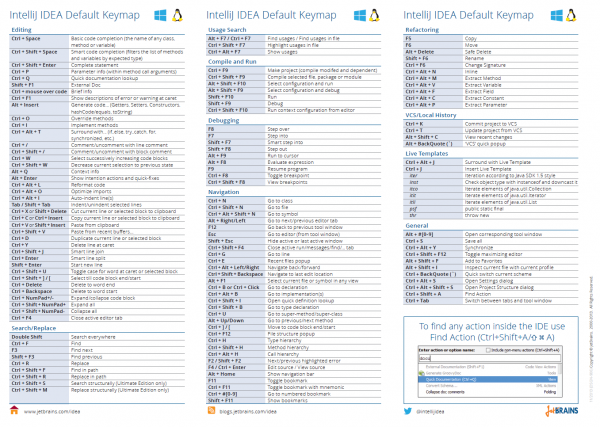 You also should change some default IDEA keyboard shortcuts to better ones like “closing editor window” with Ctrl+F4 which is too cumbersome compared to the de facto Ctrl+W. And changing “comment current line or selection” with Ctrl+/ which is impossible with Finnish keyboards to Ctrl+7. If you want to know how Eclipse shortcuts map to IDEA there’s nice post about IntelliJ IDEA shortcuts for Eclipse users and I added some in my list. Shows you a popup with all the recent files that you have opened or actually changed in the IDE. If you start typing, you can filter the files. Allows you to select code with context. Awesome when you need to select large blocks or just specific parts of a piece of code. This will try to complete your current statement. How? By adding curly braces, or semicolon and line change. Like auto complete (CTRL + SPACE) but if you add a SHIFT you get the smart completion. This means that the IDE will try to match expected types that suit the current context and filter all the other options. Allows you to reformat source code to meet the requirements of your code style. Lays out spacing, indents, keywords etc. Reformatting can apply to the selected text, entire file, or entire project. Gives you a list of intentions applicable to the code at the caret. Shows you a dialog to select previous value from the clipboard to be pasted. Allows you to comment or uncomment the current line or selected block of source code. This is originally Ctrl + / (Slash) which is impossible with Finnish keyboard layouts. In Changes tab compares the file with latest repository version. Refactor hardcoded string into variable/field/constant. Select the section of the String you want to extract, and use the normal “Extract…” shortcuts to extract it into a variable. 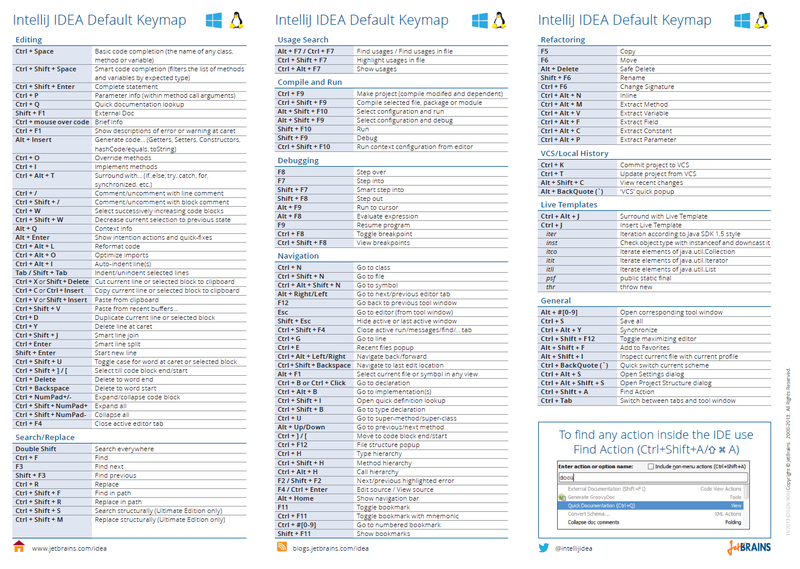 There are many useful keyboard shortcuts and you can print them from Help > Default Keymap Reference. Here are some more shortcuts which are also handy. Toggle collapse/expand: CTRL + . Not a keyboard shortcut exactly but the “iter” smart template is great. If you want to iterate though something using a for loop type “iter” then TAB to use the live template. It will figure out the most likely variable you want to iterate over and generate a for loop for it. In Eclipse it worked more logically with just typing for and then autocomplete.